Artificial intelligence makes scribbling or typing notes and reminders obsolete. Talk and the notes just happen. Specifically, I like to capture ideas about things I'd like to remember, do or write. And I'm sure you do, too. Is there an even better way to take notes? Two new products reveal the potential for combining voice and artificial intelligence to capture and format notes -- so you don't have to. 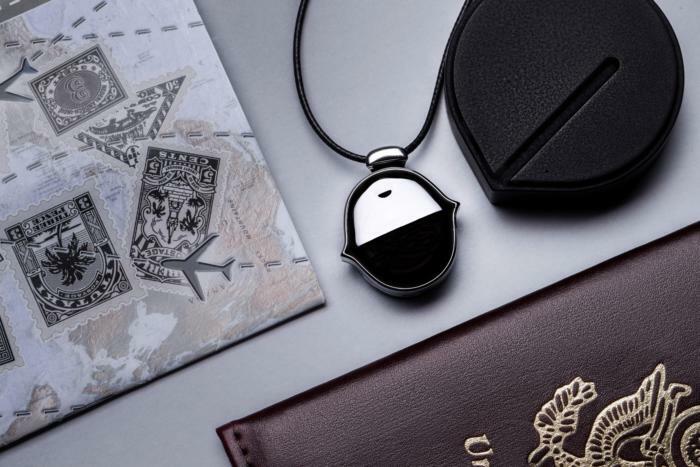 The Senstone is a wearable voice recorder about the size of a bottle cap. You can wear it as a necklace, bracelet or clip-on pendant. When you want to record, tap the top (or snap your fingers) and start talking. Tap (or snap) to stop. The Senstone A.I.-enhanced voice recorder will look beautiful enough to wear every day, unless the company ruins it with the irritating blinking light that blights the beta version. After you record, Senstone immediately begins transferring the recording via Bluetooth to the Senstone app on your smartphone, from which it's then uploaded to the cloud for processing. (Senstone supports the iPhone 5S and higher on iOS 9 and up, and Android 5.0 or higher.) In a few seconds, the transcribed text appears in the app, where it can be edited, searched for or forwarded to social media or content storage sites like Evernote and Google Drive. Flashing lights on the front indicate status -- whether the device is recording, for example. Ideas are fleeting. They arise, then vanish before you can pull out your smartphone, unlock it, find an app and type your reminder. Senstone is instantaneous and easy, so you can quickly and easily capture all your ideas and reminders before they vanish into the ether. The Senstone comes with a charging dock, which plugs into an outlet or laptop via USB. The unit will run for at least five days of mostly standby, or three hours of recording, whichever comes first. The length of recordings is limited, but it's not exactly clear how limited. Co-founder and Chief Product Officer Markiyan Matsekh told me "the speech-to-text functionality has limitations," so it's possible to record something that's too long to process. Also: When you're not connected to the phone, the Senstone can hold a maximum of about 2.5 hours of recording. The software is potentially powerful. Voice recognition uses Nuance technology and is supported in English, Arabic, French, German, Italian, Japanese, Mandarin, Polish, Russian, Spanish and Ukrainian languages. You can even say "hashtag" before the keyword of your choice while recording, then later search according to your hashtags. For example, you can say "hashtag followup," then later view all of your follow-up items by searching the app for "followup." The app will optionally capture your location, so you can view the notes captured while at work, for example. You also can download the recordings. In the cloud, A.I. identifies keywords and takes action on your text. For example, it can identify and make a shopping list, or send a note to someone in your contacts. A paid premium app subscription will give you additional features, such as automated punctuation, noise analysis for better recognition and additional cloud storage. The amounts of storage for free and paid subscription have not been decided, but Matsekh said they're currently thinking that the free version gives you 50 hours of recordings per month. . The Kickstarter page suggests a mood detection feature that "gives you insights about yourself and your daily life." I’m abstaining from recommending Senstone until I've tried the final version. So far, so good, but there are two potential problems. The first is the lights. Too many startups make the mistake of putting bright or flashing lights on their products. I assume they want their product to look active and be noticed. It's a fatal error. When the Senstone is in record mode, the lights go nuts and flash fast and furious. This is good, because it informs the user and alerts people nearby that something is going on. I like the record-indicator lights. But in normal mode, the beta version has a light that flashes once every two seconds to indicate that it's connected to your smartphone. That's a deal breaker. Flashing lights on one's person is not acceptable in polite society, let alone business settings. Worse, it may be misunderstood by others to mean that it's actively recording, creating needless anxiety and suspicion. Senstone advertises the appealing use case of placing the device next to your bed while sleeping, in case you get a brilliant idea in the middle of the night. But that would mean your room lights up every two seconds, which is unhealthy and unacceptable. Matsekh told me "the lighting scheme will likely change" and that they haven't decided on how the final product will blink and under what circumstances. If the light blinks during normal use, I will not recommend this product. The second potential "gotcha" is price. Senstone will cost $145. The prices for future optional accessories, such as fancy or rugged bracelets, have not been set. The monthly or annual fee for advanced cloud features has also not been decided, according to Matsekh. It could theoretically cost a few hundred dollars to use a full-featured Senstone for, say, three years. If the price were $99 and all bonus features included, Senstone would be a slam-dunk. But current plans may price Senstone out of the market. I'm cautiously excited about the Senstone in particular, and unabashedly excited about the future of instant, A.I.-enhanced note-taking, which I expect will show up on every kind of wearable device some day. Another enticing glimpse at the future of A.I.-augmented note-taking is a service called Clarke. The service dials into your conference calls and takes notes for you. After signing up, simply CC Clarke's email address. Clarke uses the information in the meeting invite to dial into the call, record the meeting, then use A.I. to format the conversation into organized notes, which are emailed to you as an attachment or added into systems like Basecamp, Salesforce, Slack, Trello and others. CEO and Co-founder Shishir Bankapur told me that Clarke's A.I. was developed in-house, and that the A.I. itself does all or nearly all of the actual listening, transcribing and formatting. Humans perform quality assurance, he said, to "validate the notes rather than generate them." Clarke understands a few commands, too, so you can make specific requests during meetings. The trigger word is "Clarke," and this can be followed by "remind me to," "note this down," "schedule followup," "reschedule," "send" and "find out." You can also send instructions to Clarke via email, asking for additional information on specific parts of a meeting, for the distribution of notes to additional people, to add users and get information about your account and billing. Best of all, the A.I. can label and list next steps, to-do items and other note-taking conventions, according to the company. Clarke works with regular phones, as well as Skype for Business, but not regular Skype. The service works only with the English language and U.S. and Canadian phone numbers. The company's customers include SAP, Deloitte, AT&T, the Department of Defense and Tinder, according to Bankapur. The company says all user data, including notes, are stored in physically secure locations and encrypted. It also says that technicians "may go over your notes to make sure Clarke.ai is learning and improving," but that these "employees, contractors and agents... are subjected to strict confidentiality obligations and may be disciplined or terminated if they fail to meet these standards." The company also gives customers the option to remove all data from its servers. Clarke costs $15 per month for up to five hours of calls, plus $10 for each additional 5 hours. You can try it free for a week. Senstone and Clarke may be great products worth paying for. More importantly, they represent the beginning of something great, namely the end of note-taking and the beginning of better notes. Thanks to voice recognition and A.I., we're heading for a world in which random thoughts, ideas and tasks can be captured the instant we think of them, and information-dense encounters such as meetings will involve actionable data captured without any human effort. It's a prospect that's beyond exciting. It's noteworthy!